Missouri is ranked seventh in the nation for food insecurity, which is the lack of money or resources to obtain appropriate foods for a nutritious diet, and has the fifth highest rate of child food insecurity in the country. Now, through a new grant, the Interdisciplinary Center for Food Security (ICFS) in the College of Agriculture, Food and Natural Resources (CAFNR), and the Health Communication Research Center (HCRC) housed in the University of Missouri School of Journalism, will work to increase the availability of healthy foods and nutrition education in food pantries in Missouri. The Missouri Foundation for Health has awarded MU a 5-year grant of nearly $500,000 to research and assist eight food pantries in northeast and central Missouri. The ICFS and HCRC will partner with food pantries to develop ideas and activities that can then be replicated by other pantries around the state. Another goal of the grant is to provide gardening resources such as seeds and educational materials to help people expand their gardens or start new gardens. McKelvey says that the project will also partner with groups to provide food preparation demonstrations of less common, healthy foods. In addition, MU plans to help create a learning community among food pantry directors, staff, and volunteers. The ICFS and HCRC at MU are currently holding initial meetings with the first two food pantries involved in the project, the St. James Caring Center and the Shelby County Food Pantry. Plans are also underway to distribute garden seeds and information starting in March. 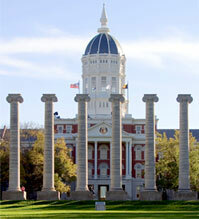 This collaboration is an example of the Food for the Future area of Mizzou Advantage. Mizzou Advantage is a program that focuses on four areas of MU strength: food for the future; media of the future; one health/one medicine; and sustainable energy. The goals of Mizzou Advantage are to strengthen existing faculty networks, create new networks and propel Mizzou’s research, instruction and other activities to the next level.